Q: What famous actor with obsessive compulsive disorder (OCD) tendencies played the role of another famous person with OCD? 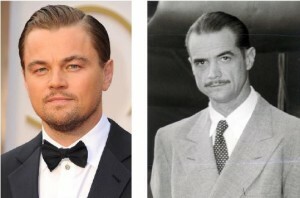 Leonardo DiCaprio, played Howard Hughes in the 2004 film Aviator. The film depicts the life of Howard Hughes between the 1920s and 1940s, during which time Hughes became an aviation tycoon and movie producer while simultaneously battling severe obsessive compulsive disorder. DiCaprio reports that he deals with OCD tendencies, stating that he has to force himself not to step on every chewing gum stain he encounters on a sidewalk and fight urges to walk through a doorway several times, because he doesn’t want his condition taking over his life. Howard Hughes, Jr. was an American aviator, engineer, industrialist, film producer and director, and one of the wealthiest people in the world. By the late 1950s Hughes had developed debilitating symptoms of social avoidance behavior and obsessive compulsive disorder.